^ "Dark Angel". Voicesfromthedarkside.com. Archived from the original on 2007-03-10. Retrieved March 4, 2007. ^ Neely, Kim (2002). "Slayer: Album Reviews". Rolling Stone. Archived from the original on 2007-04-03. Retrieved 2006-11-29. ^ Diamond Oz (July 22, 2012). "Sunday Old School: Slayer". Metal Underground. Retrieved 22 February 2015. 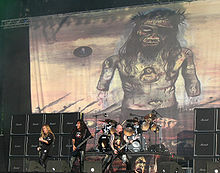 ^ "Cannibal Corpse'S Pat O'Brien Will Step In As Slayer'S Guest Guitarist | The Official Slayer Site". Slayer.net. May 19, 2011. Archived from the original on 2011-07-23. Retrieved July 1, 2011. 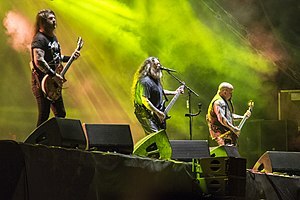 ^ "Kerry King of Slayer Talks Mayhem Festival, New Music, and Looks Back on "Divine Intervention" @ARTISTdirect". Artistdirect.com. Retrieved 2015-07-26. ^ a b "Dave Lombardo – Statement From Dave Lombardo Regarding..." Facebook. Retrieved 2015-07-26. ^ Kielty, Martin. "Slayer will carry on for Hanneman". Classic Rock Magazine. Archived from the original on 2013-06-21. Retrieved June 19, 2013. ^ "Slayer Announcement". YouTube. Retrieved 2015-07-26. 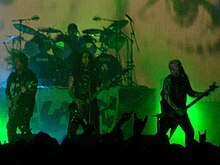 ^ "Slayer 2017 Manila [DOLBY] – YouTube". YouTube. Retrieved 2017-10-12. ^ "Hatebreed Music Influences". MTV. Retrieved 2015-07-26. ^ "Pantera Music Influences". MTV. Retrieved 2015-07-26. ^ "Kreator – Mille Petrozza". metal-rules.com. 4 October 2006. Retrieved September 28, 2013. ^ "Kerrang! Awards 2006 Blog: Kerrang! Hall Of Fame". Kerrang.typepad.com. Retrieved 2014-04-23. ^ "Kerrang! Awards 2013: Kerrang! Legend". Kerrang!. Archived from the original on September 30, 2013. Retrieved 2014-04-23.